Your mission this week, and not nearly an impossible one, is to compose your want lists and check them twice and, what’s more, map out your travel plans for Record Store Day 2017, happening in your town, and yours too. Record Store Day (RSD), 10 years young this year, is the vinyl fan’s national holiday and quite the occasion for a big group hug. Taking place Saturday, April 22 at independent record stores worldwide, it’s the place to be to snag special RSD exclusive platters, fill in holes in your collections of archival and current artists, and meet with fellow vinyl hounds to talk shop, if by “shop” we mean, and we do, the musicians we love and, by the way, which albums and artists are in your top 10. What’s on your Record Store Day list this year? How about an extended vinyl version of Elton John’s famous, early live album, 17-11-70, with six never-before-heard songs and a newly-remixed version of “Amoreena,” a bonus track included on the CD reissue of the album back in 1995? How about The Count Five’s Psychotic Reaction album from 1966 in mono on 180-gram vinyl? Zombies fans will want to snag a copy of a special 45–on pink vinyl, no less–pairing a previously unheard version of “A Rose for Emily” and the version of “This Will Be Our Year” that everyone knows and loves. Whatever your desires, an indie record store near you on Record Store Day 2017 will likely be able to fulfill them. Our hearts are with Trax on Wax; we hope yours are pledged to support your favorite local independent record stores, wherever they may be. Learn more about Trax on Wax by clicking here. Record Store Day 2015: Crazy, Man. Crazy Good. It’s after lunch on this sunny Saturday, sometime after the regular crowd shuffles in to the various quick- and long-stop eateries along Frederick Road in Catonsville, Maryland. A woman, probably in her late thirties, maybe her early forties, walks carefully around the tight corners and through the narrow walkways separating the fully-stocked shelves and displays populating Objects Found, a neighborhood antique store within which shiny, happy jewelry pieces and Elvis Presley collectibles sit happily side by side in nooks and crannies and behind glass doors in crowded cases. The woman, looking here and over there, but not too far afield, is hearing the songs played through the store’s audio system, and they are coming one after the other and, what with her looking for just the right item or items to bring home, wrapped in tissue paper and put in bags at the counter, it is hard to distinguish one song from the other, but as if by some magical means, one song catches the woman’s ear and burrows into it. 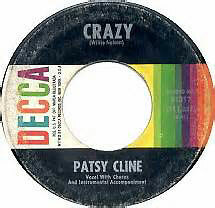 “Crazy,” the woman sings, “I’m crazy for feeling so lonely.” Whether she knows it or not, the woman is singing something approaching a duet with Patsy Cline; the woman matches Patsy word for word, perhaps not exactly in meter or in key, but she is right on the button with her. “I’m crazy, crazy for feeling so blue…” All the while, as the melody flows through her, her face never betrays the feeling; she knows the song, has lived with that song for at least a time; maybe she heard it when she was growing up or discovered it at a friend’s house. Maybe she heard it on the radio, on some country station or oldies outlet. It doesn’t matter; she knows that song, and the act of singing it as she is shopping for something to cherish, however large or small, means that she cherishes the song, too. And then, as “Crazy” fades into another song that perhaps doesn’t strike a chord with her, the woman stops singing and moves forward through the store; a ring or a doll that looks vaguely Victorian is calling out to her, the way that music, the way that particular songs call out to people and burrow in and, really, what can you do about that other than sing along? There was a lot of singing along, mostly, probably, silently, and tapping of feet at the famed Catonsville depot for vinyl records old and new and newer still on this Saturday in April, round about mid-month, just after tax day–a beautiful day, with the temperature rolling around the 80-degree mark; a day when even Fido could cool off with a tasty drink; shirt-sleeve weather delighting passersby and record geeks and music fans and folks who love the oldies or the latest hits or some kind of thing in between; people both young and older; people whose high-end sound systems can blow the roof off of their houses and their neighbors’ houses, and people with entry-level, all-in-one turntable systems; people for whom only the finest vinyl pressings will do and those who aren’t quite so fussy. 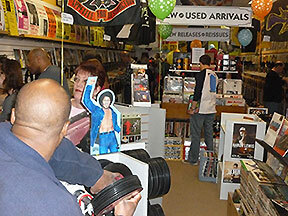 All of these people are gathered at Trax on Wax in Catonsville, Maryland at about 11:30 in the morning, gathered together as one like-minded group, even if they don’t know it, snapping up the special Record Store Day releases and thumbing through the stacks that house upwards of somewhere in the neighborhood of 20,000 albums, give or take. 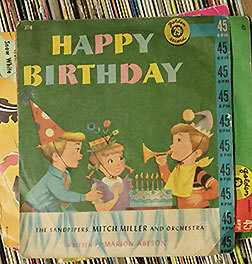 Even a stack of old Golden Record 45s and other single delights shines brightly with one entitled Happy Birthday on top; the record inside of the brightly colored sleeve, depicting a kids’ party complete with lit candles on a festive cake, has part one of “Happy Birthday” on the a-side and part two on the b-side. The record, which advertises on the back of the sleeve other Golden Records–“3 Little Golden Records on a 45 RPM EP – 6 Songs and Famous Littles on Both 78 RPM and 45 RPM”–features the song stylings of the Sandpipers and Mitch Miller and his Orchestra and is from about 1960, when it could be had for a measly 29 cents. The Famous Littles were priced slightly higher in Canada–35 cents, to be exact. “Ask for the Fabulous Golden LP records, only $1.98 ea.” You could get a lot for so little back in the day. But these Golden treasures, stacked on the floor in the back of the store, were only the tip of a very large iceberg; rock, pop, jazz, specialty, soul, comedy and just about anything you could want ruled the day and lined the shelves. Special Record Store Day releases were displayed on the walls to the left of Trax’s entrance. Amidst the Record Store day chatter, you could probably hear people saying, “Hey, there’s the Sly and the Family Stone live album recorded at the Fillmore and never released until now!”, “Man, I love the White Stripes!”, or “Those Kinks EPs look rather tasty!” And “Do you have–” Well, that was probably the number one question asked of Trax on Wax owner Gary Gebler and his manager Jeff Ball and the other knowledgeable, passionate-about-music-just-like-you folks working that day. It was a day all about family; it was a day all about people who like the feeling they get when they are around other music and vinyl fans, people who grew up with the sounds of music and carried those deeply-set feelings through adulthood and people who just discovered the joy of holding a record album in their hands, of looking at people-sized artwork and included posters and stickers and full credits that tell you who played what and twiddled the knobs in the studio. It was a day about the extended family of vinyl hounds and casual music fans converging on the little store that does in Catonsville, and, really, it was a day of getting together and turning each other on to some band or singer or spoken word artist who really rings the magic bell time and time again. It was a day of joy for David Harris, a collector of records played on fine audio equipment who knows what’s what, who is like a moth drawn to a flame when color pressings are in his sights; a man who lives and breathes music and for whom vinyl is a way of life–a man who talks about his favorite records and vinyl finds and lights up with such strength that he could probably power a city like Las Vegas, if such a thing were possible. 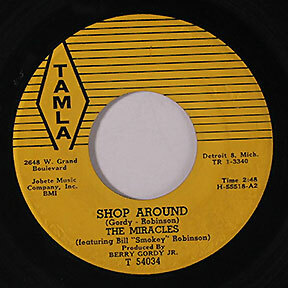 The first 45 that Gwen Mister owned was “Shop Around” by the Miracles (actually, by the Miracles featuring Bill “Smokey” Robinson, as the credits read on the Tamla single label). 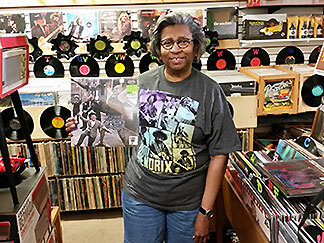 Gwen was at Trax on Wax looking for Record Store Day releases such as the 180 gram mono pressing of the Doors’ Strange Days album, which she found and proudly shows off in the picture at left. In a perfect world, and this world of vinyl hounds and fans of Diana Ross and fans of just plain good music is about as perfect as it gets, every day would be Record Store Day–that is, a day to visit local, independent record stores to visit with the staff, talk to the owner, greet the day with a new vinyl find and pledge to come back again soon now, you hear? 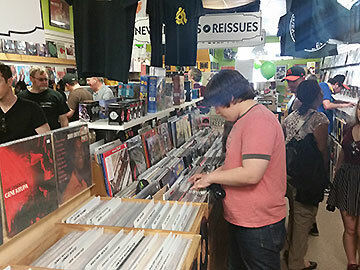 On April 18, 2015, a sunny day, a beautiful day along Frederick Road in Catonsville, Maryland, at the center, the hub of vinyl experience for vinyl hounds and music fans who know what’s what and what’s up and what to look for in a sea of treasures, Record Store Day shone. It was a crazy day, a great day, a day that will stand among other days that came before and will come after. This day, this quite sunny and spectacular day, will be remembered by the people who were there. These people will play their records and think back to this day, and next year, around the same time, they will hope for sunny skies still, but really, really, it’s all a state of mind; every day is a sunny day when the music is playing and the beat, ultimately, will go on. 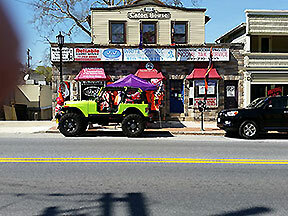 Trax on Wax, in Catonsville, Maryland, is the official record store of Pure Pop Radio. 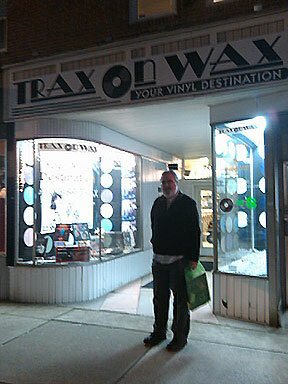 When in the Baltimore area, we recommend that you make Trax on Wax your number one vinyl destination. Visit Trax on Wax’s website by clicking here. The Peanuts Crosley Cruiser is the official turntable of Pure Pop Radio. The national holiday of vinyl worship, held on one blessed day a year, has once again come and gone, but this year–this year of limited releases from big names; medium names; and smaller, perhaps hungrier names, and a special, most smile-inducing, now coveted item–was perhaps the best of them all, a day in the year that will go down as the day that the lure of vinyl became part of the way of life for even more new vinyl lovers than ever before. The art of embracing the vinyl experience, of holding an album cover and experiencing every pixel of the art, of unfolding the included posters and examining the other included tchotchkes–stickers, cutouts and the like–is an art unlike any other. The whole vinyl experience is an all-encompassing one that can not come alive in a CD store or during an online purchase. 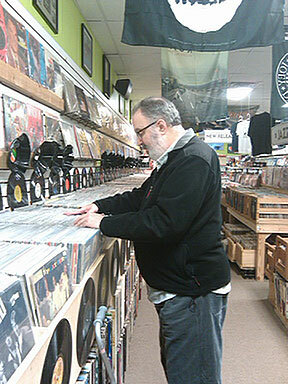 Today, as in days gone by, the real vinyl experience occurs in a record store, independent in nature, owned by a music guy who has dedicated his life to the pursuit of the great platter. This store is staffed by similarly-schooled kids-to-adults who take the right amount of pleasure in turning a customer on to some cool, real, really real sounds. On Record Store Day, which has been going strong and now stronger still since 2007, vinyl people–true music fans all–converge on their local, independent record stores to purchase Record Store Day releases that are noted with a sticker, announcing themselves as honest-to-goodness Record Store Day platters. Also in the mix: used records and 45’s and the usual new release suspects. This year, the stars in the bright sky converged to create the Crosley Peanuts Cruiser Record Store Day Turntable, a highly-coveted item adorned with Peanuts comic strip record-related illustrations. The turntable, as you might imagine, sold like the highly-coveted hotcake it is. From inside the box, the turntable screams “Oh Wow!” You are drawn to stare at the box for as long as you must, but really you must open the box eventually and get to spinning. Record Store Day 2014 set Catonsville, Maryland alight! 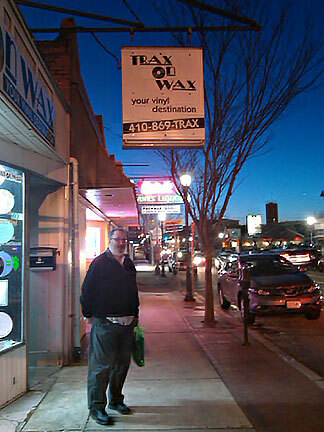 At Trax on Wax in Catonsville, Maryland, owner Gary Gebler, a deeply-knowledgeable record man with more than 40 years experience in the music industry, worked tirelessly with his manager, unpacking Record Store Day boxes bulging with Record Store Day releases as a line of vinyl hounds, long as can be, hugged the sidewalk outside of the store. The hounds pushed gently through the door when the store opened and, for the first hour of business on the Saturday, focused on the official Record Store Day releases, snapping up the Wizard of Oz soundtrack on green vinyl; a Donny Hathaway live album, recorded in 1971 at the Bitter End in New York City ; and a Devo disc, among other treasures. It’s customer mania on Record Store Day 2014 at Trax on Wax! 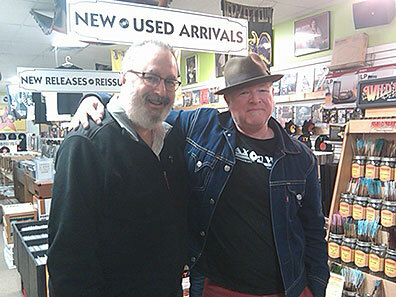 Gebler spoke exclusively with Pure Pop Radio’s Alan Haber about the 2014 Record Store Day experience. 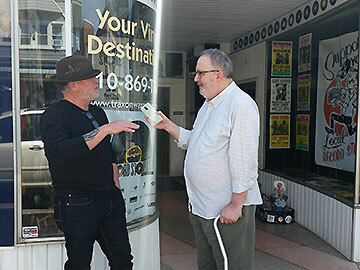 Through the eyes and ears of a music industry veteran, you get the inside-out view of the day’s purchasing and hoopla. If you’ve ever wanted to know the inside story of Record Store Day, you’ll want to listen to this spirited conversation about every vinyl fan’s time spent in the platter’s favorite mecca. Oh, and by the way: Record Store Day 2015 begins spinning in 353 days and 11 hours. The next meeting of vinyl minds is just around the corner. 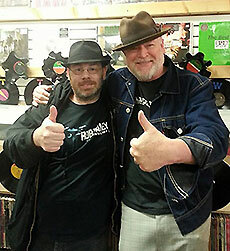 Click on the play button below to hear Alan and Gary relive the Record Store Day 2014 experience! It was a short, happy trip to just outside Baltimore in a quaint little town called Catonsville in Maryland, up 495 to 95 and on to 166–almost a straight shot along a couple of I’s and an MD. 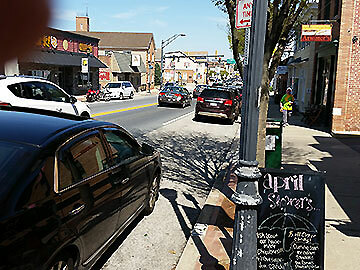 This part of Catonsville seemed like a sleepy, small college town. All sorts of handy shops lined the sides of the narrow street. And there, amidst the quiet of the middle-afternoon, cold and crisp air alight, was Trax on Wax, a shop stocked full of vinyl that spanned the ages. Old, rare, new; rock, pop, jazz and belly dancing; the popular, the left-of-center and the rites of summer, fall, winter and spring. A lost colony, if you will–something akin to a kind of Brigadoon, perhaps. A place out of time and, at the same time, in synch with the world. Or at least the part of it that swings, rocks and rolls. I was already familiar with Trax, having conversed online with the owner Gary Gebler and enjoyed his posts of record-related pictures on Facebook for some time, so a trip to the store was one that seemed to always be in the cards. A fan of Pure Pop Radio, Gary had the station playing in the store as my wife and I approached it, so I knew we would be in good company. The door opened and it all seemed so much like the black and white of Kansas changing to the color of Oz–thousands of vinyl record albums all of a sudden present and lining the walls and making themselves known in the center area and behind the counter–all immaculately arranged and displayed. This was the land of milk and honey. “Alan Haber?” Gary and I shook hands and my wife and I said hello. We talked awhile about the store, about music, about those things that one chats about when those sounds are all around them. 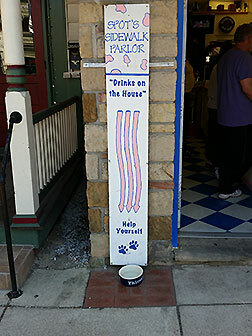 I noticed a poster aside the counter that was promoting the music of Jacob Panic, whose songs play in rotation on Pure Pop Radio. “I don’t know if you know,” Gary offered, “but that’s my son.” It becomes a smaller and smaller world every day, right? Jacob was out for awhile, but would be back soon. I couldn’t believe my luck. Jacob had quickly become a favorite of mine–a multi-instrumentalist who is part power pop, part bluegrass, and part other stuff. He was the original banjo player in Graham Elvis’s Sgt. Popgrass collective. Truly a most talented individual. 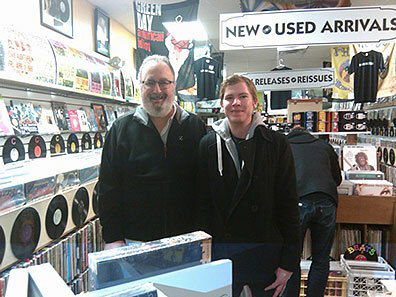 We browsed and we bought–an self-titled album by a group called Glass Moon that I didn’t own–and met Jacob who, like his dad, was quite the warm and friendly sort. It was a great pleasure shaking Jacob’s hand and chatting with him. And then we took it all in some more. Trax was the kind of place that any music fan would be happy to get lost in or order from (the shop does mail order, too). We took a few snapshots (lensed by award-winning, Daily Planet photographer Janet Haber) and we talked some more. I wanted the visit to continue, but darkness was falling outside and it was time to go, time to become one with the straight shot back to Virginia. I understand what people mean when they shout “Vinyl is back!” Truth is, it never left. It’s always been there and continues to live and breathe inside shops like Trax–shops that are run by people who know and love the music and live for those platters that matter. 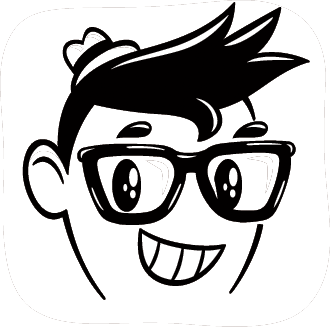 Trax is not a job for Gary Gebler–it’s a calling. It’s the air that he and his customers breathe when they’re feeling the urge to spin a slab of black vinyl–when they can practically feel the head of the tone arm between their fingers; when they can feel the needle resting comfortably in the grooves of the music that gives them that certain feeling that can be felt more than it can be verbally explained. It was indeed much like the old days for my wife and I, but these are the new days–the days on offer today–the days that we can count on to carry us on to tomorrow, when the urge to soak up those sounds that move us grabs hold of us and make us seem brand new. The romance of vinyl–the art of feeling the vibes that we are hunting for–is still with us. The art of putting the needle down into the grooves and laying back with the cover and liner notes and lyrics and posters and stickers and such is still with us. It is the art of being alive.